This month it seems I will not be able to write four posts. It feels awkward to break my promise for the continuity of my blog. However, yesterday I had the privilege of being guided to a project in Utrecht which proceeds very slowly indeed. It shows the relativity of joining a Weekly Post Competition or a Post a Day Challenge. This post has at face value only a very slim connection with legal history, but perhaps you might detect here a deeper meaning. 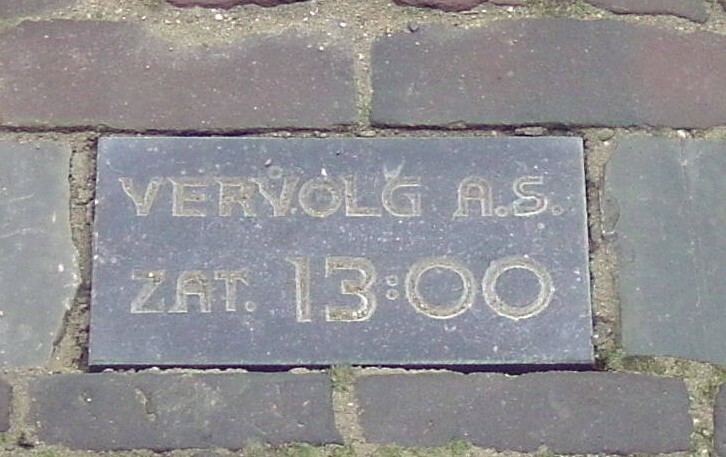 On June 2, 2012 Aleid Wolfsen, burgomaster of Utrecht, opened the project The Letters of Utrecht (De Letters van Utrecht) by uncovering a line of stones with the words of a poem in the pavement along the medieval canal Oude Gracht. You have to begin somewhere to give the past its place (“Je zult ergens moeten beginnen om het verleden een plaats te geven”) is the first line by Ruben van Gogh of a poem to be written by a collective of poets working in Utrecht. To create an impressive start the project showed in June immediately a number of lines, but this was only a consequence of using a convenient starting point. For every week since January 2000 a stone with one letter has been put into place. The pace of one letter every week means the poem will become visible at a very slow speed indeed. At present some 650 stones are visible. Every Saturday afternoon a new stone is prepared in situ by a mason and put into its place. The first stone of the project is a gift from The Long Now Foundation hewn from the Sierra Diablo Mountain Range in Texas where a 10,000 Years Clock is being installed since 1996. Behind the project in Utrecht is the Million Generations Foundation, an organization which invites people to think about the future of the earth, its people and civilization in the very long run. Its founder, Michael Münker, my guide yesterday, is also on the board of the foundation for The Letters of Utrecht. Among the immediate offsprings of the Long Now Foundation are The Rosetta Project for a public digital library with texts from all documented languages, and PanLex, a project for a multilingual translation database and interface. At first the name of the PanLex project led me to guess it aims at creating a database of laws worldwide! In fact you might indeed try to use it as a juridical multilingual dictionary. After spotting in the pavement the word guilty (“schuldigen”) I knew for sure I had a pretext to write here about this project. The word is a part of line in the poem by Ellen Deckwitz where the medieval tower of Utrecht Cathedral points as a finger to heaven to identify the guilty (“…schuldigen aan te wijzen”). My picture of this text is rather vague, but on second thought this can function as a mitigation of the rather strong image provided by the poem. Yet another line by Ruben van Gogh near the very start of the poem struck me even more: the present matters ever less (“…het heden doet er steeds minder toe”). The words of this poet run directly against the mainstream of contemporary life. However, it is only in the present that we can read his words and reflect on them, but he provokes us to realize that our view of the present is guided by the past. Is it sheer coincidence to reflect on words by someone named Van Gogh in the very weekend the Van Gogh Museum in Amsterdam closes for a seven-month renovation? 75 paintings by Vincent van Gogh will be shown temporarily to the public at the Hermitage Amsterdam. Anyway, the present visibility of the project in Utrecht is not only provided by a website, but also by presence on Facebook and Twitter. It is certainly food for thought to look at a project aiming for the ages which is firmly present in the virtual reality using the media where people often seem to focus on actual situations and activities! Another aspect of The Letters of Utrecht is the use of a font specially created by the Avant la Lettre foundry. The capitals of this font make me wonder about the form of a accompanying basic font yet to be made. I like the fact that a project which invites you to look into the distant future uses a contemporary font. As for the project in Utrecht it is no wonder if you are reminded of laws carved in stone, a subject touched upon here in some posts here, too (The voice of Hammurabi and Carved in stone). Using stones as a material to make texts visible for all times still has the attraction of one of the ways to reach into eternity. The use of stone is a part of the image a text creates, and thus I decided to include this post not only in the Utrecht section of my blog, but also under the heading Legal iconography. This entry was posted in General and tagged Cultural heritage, Legal iconography, Utrecht on September 24, 2012 by rechtsgeschiedenis.